Am I the only one wondering why the future went so monochrome all of a sudden? 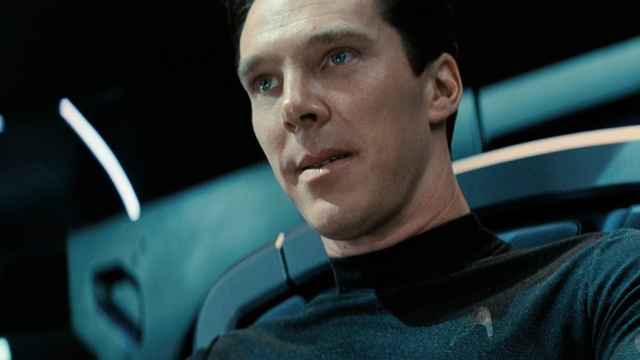 I'm actually expecting Benedict Cumberbatch's ship to be all black now. Didn't give it much thought till you pointed it out. San Francisco is all black. Wherever they are, it's pretty dark gray. Black uniform, black seat, black walls. Pretty sure he's on the bridge of his own ship. Also looks like the bridge or some chamber on his ship. Black. They could be using the color scheme to reflect a dystopian future, even if Blondie looks pretty well fed and hot in a totalitarian city. 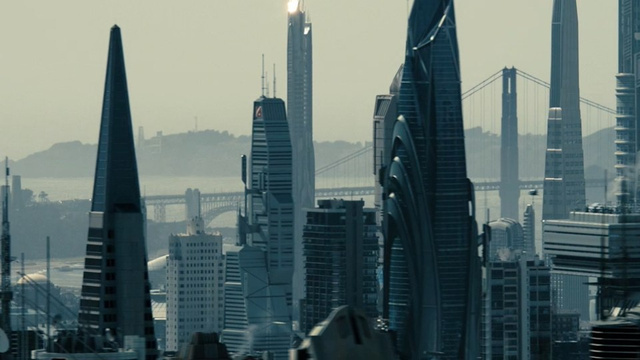 But that's the strange thing, Earth ISN'T a dystopia in Star Trek, it's the exact opposite. In fact, it was sort of a running joke in the show that people from Earth are boring cause they don't have war, famine, starving people, uneducated or sick people. racism, or even proper prisons. I will grant you that before that things really went into the sh*tter, but Trek's the rare SF series that said humanity basically decided they had enough of that and pulled themselves out of a rut and fixed all their own problems. I get what you're saying, but that is all in the past, meaning it's stuff that we have already seen. This is JJ Abrams after all and he was able to bring something fresh and exciting to the Star Trek mythology and give us an exciting and awesome movie. I never thought I'd hear myself say that about Star Trek. A little background, I HATE Star Trek. I hated the movies (with the exception of Wrath Of Kahn), I've hated the few episodes I've seen of each new series, I just hated the franchise. I went in with such low expectations with the reboot and came away surprised at how great it was. The sole reason I even went to see it was because of JJ. So, even though I am avoiding all spoilers about what Darkness is about, it's not beyond reason to think that JJ has something up his sleeve to further break what I always thought was a boring mold. The only reason why I'm anxious for the new Trek movie is because of the reboot. I don't have issues with Sci-Fi. It's one of my favorite genres. I just never like the Star Trek universe and I always thought their mythology was overrated. I'm sure there are plenty of people sharpening their sticks, ready to say the same thing about Star Wars, my preferred choice of the two. 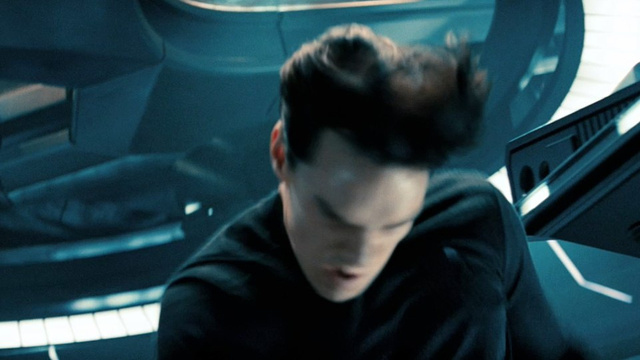 I was thinking about this, what would you all think of Star Trek Into Darkness having an opening or ending theme sequence a la James Bond? Naked chicks with phasers. I'm all for it!! Particularly if Alice Eve is one of them! Because of the colour scheme I mentioned before, I'm kinda picturing something with the style of "Girl With The Dragon Tattoo" without the messed-up nature of it. I like the new trailer, but it still feels a bit lite to me. By this, I mean I want more bang for my buck. Well, they might not want to let too much out given that the movie doesn't come out for another seven months. And I will say, after seeing the first ten minutes, I still don't have any idea what's happening. No hint of the big picture.